Got something to say? If you have a comment about something you've read here, or if you'd like to contribute something of your own, please let us know! 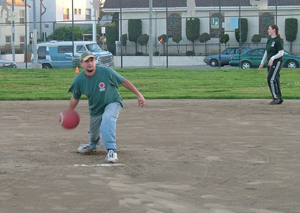 Have a personal kickball anecdote, a question, or a comment about last week's game? We want to hear from you. You can drop us a line anytime. Regional rules have changed and ANY winning team from any prior seasons can play in the regionals now! So make this playoff count! And just in case your team gets knocked out early, sign up for next season and prove the pundits wrong! Webstaff Gets Party Dates wrong! So maybe you've all written down May 15th for the end of season party. And maybe you were thinking, "Man, that's just too soon. . . " Yay! You're in luck! I got the dates wrong! The end of season party is ACTUALLY May 22nd! It's still a Monday, but you have a week and a half til it arrives. WHAT: Join us for Xtreme Bowling and Cut Throat Karaoke! WHO: Everyone! Bring guests, be sure to RSVP! Now that you've been thoroughly conditioned all season long with kickball, its time to show off your skills as a pro bowler in the making with some Xtreme bowling at Bayshore Lanes. They'll dim the lights, set up the fluorescent bowling pins, crank up the music, and watch you try for a turkey. $7.50 includes entry fee, shoe rental and bowling. Five tickets can be used to refuse a song for good or GONG (kick a bad singer off the stage). With the purchase of a coupon booklet, you'll receive three bonus coupons and two song refusals and one GONG - a $15 savings! Remember, all proceeds go this season's charity, so be generous, be evil, and have fun! Please let us know you're coming! Drop us an e-mail at drinkforcharity@gmail.com. Let us know your name, what team you play on and the names of any guests that you're bringing. Pregnant Cheerleaders Win In Winter! Through wind and rain and lightning and chilling marine layers, the Dogtown Winter '06 season has come to a close and the shirts in royal purple remain on top. The play-offs were hard fought, especially in the 2 games leading up to the finals. Both the Turtles and Ace Of Base narrowly lost to the Whackers and Cheerleaders. The Turtles, holding the Whackers to a virtual tie for a full 5 innings were one bases-loaded single to taking the lead in two seperate innings. Ace of Base held the Cheerleaders to an amazing SINGLE run, but couldn't get a toe across home and were shut out in one of the closest play-off games I've ever witnessed. The finals were a different story. Maybe it was the chilling cold that seeped into their bones as they waited for the Cheerleader/Base game to play out or possibly it was the stress of fighting off the upstart Turtles for a full 6 innings. . . but whatever the reason, the Cheerleaders found their game in the latter innings and they shut down the Whackers for all 5. The season ended in a blow-out. We had a great season and everyone played well in the post season. We look forward to seeing you all next time around. Congrats to the Whackers and the Cheerleaders for making it all the way to the end. Congrats to everyine else for helping to make Dogtown the best place to kick a big rubber ball! On behalf of the entire website staff (myself), we'd like to apologize for not covering the playoffs more in depth. To make up for it, a full GMOT will be packed with end of season content before the end of season party. Registration Open! Pick-Up Game Next Week! Sick of the rain and cold nights? Tired of scraping mud out of your ears before going to Brennan's? You're in luck because next season will be starting soon! Registration for returning teams has begun and now's the time to get your registration in for the Spring '06 season! New players that have been patiently waiting in the wings should start scoping out the teams and coming out to the playoffs and pre-season warm-ups to get a few kicks in before everything starts to count. We're expecting a huge turnout this time around, don't get left waiting on the bench another season. Head over to MyWAKA and start filling out them forms. Our extra-special host bar, Brennan's has agreed to be our home away from the field again. We expect bigger parties, hotter competition and even more flip cup! We finally have everything set up for another season of Dogtown kickball and want to get the information to everyone as soon as possible. We're pleased to announce that registration for Dogtown Division's Spring 2006 season is now OPEN. We'll be back once again at Oakwood Rec Center and are pleased that Brennan's wants to have us back for a second season. There will be one week of pickup games on Wednesday May 17th before the season gets going on May 24th. The next two weeks will be the playoffs for the Winter division for anyone wanting to see kickball action before you can take the field. Returning veteran teams will get expedited promotion from Group to Team status, and dibs on their usual shirt color. So don't wait - Register now and keep your dynasty alive! New to Kickball? Starting your own team? Or just want to make sure you play with your friends? No problem! Just sign up and either register as an Individual, join an existing Group, or create a new Group. When you start a Group and your friends join it, you'll be kept together no matter what. No group is too small - you'll get matched up with other groups to form the final Teams of up to 26 people. For the best chance of *not* having people added to your team, try to have at least 8 males and 8 females approved to your team by the Registration Deadline to be determined in the next week. So whether you're a free agent, a small group, or practically team-sized already, sign on up soon! If there are ANY questions, please email me and I'll get back to you ASAP. Also, if there is anyone interested in being on the board for the league, please let me know. Even if you don't want to be president, we can find other roles from setting up fields to planning the fun social events for the league. I hope to see everyone out soon. RAIN DELAYS: Make up games are hard to squeeze in. Rain delay decisions are made at the field. Don't assume we've called the day off. Drop by the field at the scheduled time. If we cancel, we'll head to the bar early for flip-cup! Division Bar - It's official! 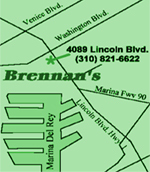 Our WAKA Division Bar, Brennan's of Marina Del Rey, is even more important than our home field. It's the heart and center of the division's social aspect. The field is a place for team solidarity, but the division bar is where you learn that the people in the other dugout are just as good-natured and fun loving as yourselves! If that doesn't sell you on it, then how about happy hour deals for WAKA players all night, every game night!? In addition to their $2.50 burgers (2 for 1 pricing), we also get $2.50 domestic tap beers (Bud & Bud Light)! What other bar can you drop $10 and get 3 beers and a burger? Nowhere, that's where. So make an effort to come out after every game and let the division know that there's no ill-feelings. What happens on the field, stays on the field. What happens at the division bar are the memories we keep for many seasons to come! Brennan's has welcomed us with open arms! We have a new home for the post-game Dogtown celebrations and libations! Once you're done with your game or cheering on other team favorites, get those cleats on over to Brennan's for some food and drink. They have a wide selection of games and live music as well as a large patio where they host turtle races every Thursday night! If nothing else, come by for a game of flip-cup and reclaim any tarnished glory you may have lost on the field by displaying your finely honed drinking-dexterity. We'll see you there!